You've seen the webisode and the great room/kitchen/nook/mudroom, so today we're moving to the rest of the main floor! We worked with Tiek Built Homes throughout this project and I love the fresh result. The shape of the master stayed about the same, but we added this amazing ceiling detail. I love how it turned out. Taking the shutters out really helped everything feel so much happier. This watery blue-green wall color (cut at 50%) has quickly become one of my favorite paint colors. The AFTER was widened, flipped around and just made awesome. 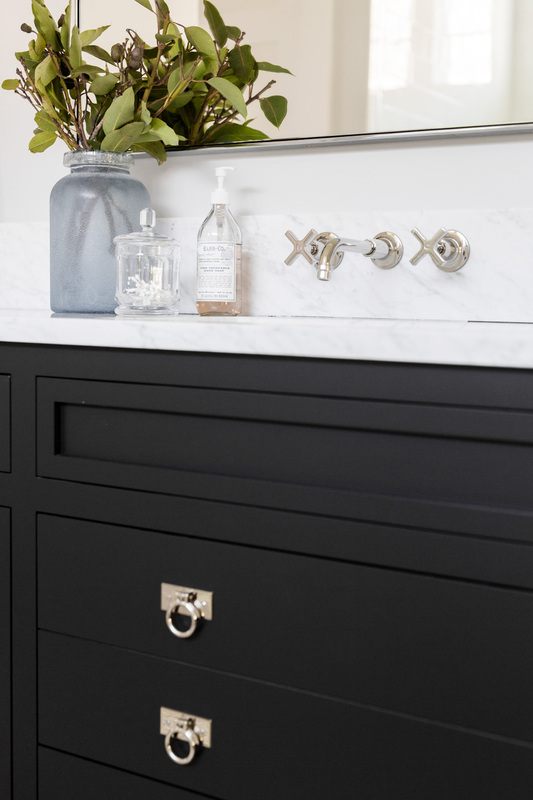 I'm obsessed with the black vanity and Waterworks ring pull hardware. The sconces are even cooler in person because they have an acrylic backplate! Here is the Butler's Pantry. We love the warmth the natural wood floating shelves bring to the space.